With football playoffs & the Super Bowl coming up, my mind has continued to drift towards finger foods. You know, the kind that you can mindlessly inhale while you chat & do your best to follow the big game? Luckily, these are packed with simple, good-for-you ingredients that won't leave you with as much of a gut-ache, had you scarfed down a giant bowl of nachos. Because as good as that feels in the moment, we all know hindsight is 20/20. I call these "Chicken Fajita Poppers"... poppers because they *pop* while they're cooking, and they're the perfect bite size to pop right in your mouth. The flavor is also amazing.... which gives them yet another "pop" factor! 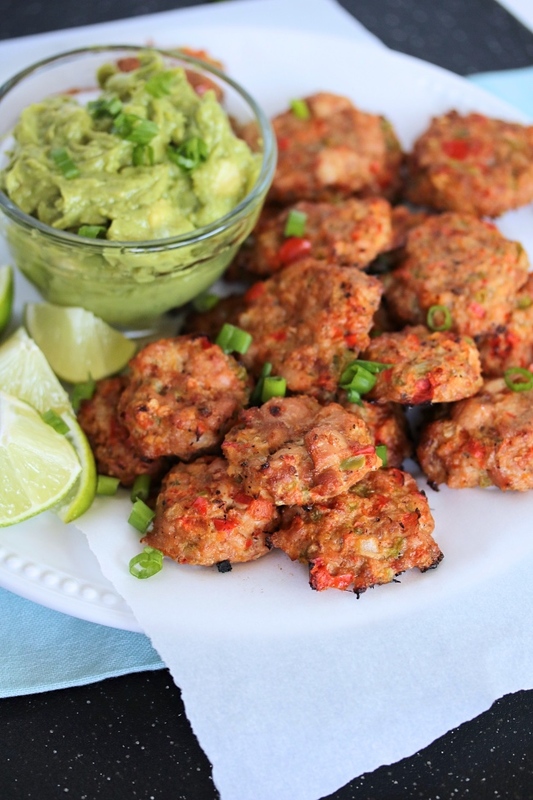 And while these are perfect for game day, they also make the ultimate meal prep food. Bake a batch on Sunday, then mix & match them with meals throughout the week. They're great over a Mexican-style salad, in a cauli-rice burrito bowl topped with salsa & guac, or snacked on solo after a workout. Don't be intimidated by these ~ I promise you they are SO easy to make! Just break up some chicken in the food processor (much simpler than it sounds, takes just a few seconds), then pulse in the veggies and spices. Scoop onto a lined sheet, and bake. That's it! You're on your way to a fajita fiesta in no time, with a no-fuss method and super easy clean-up. As far as the chicken goes, you could also go for ground chicken, then omit the food processor all together. I like to break up my own so I can choose what quality of chicken I'm grinding - and I also like to make sure it's thighs, which are more flavorful. The choice is yours, and I'm sure they will be delicious little party bites either way! I hope you love these as much as we did! 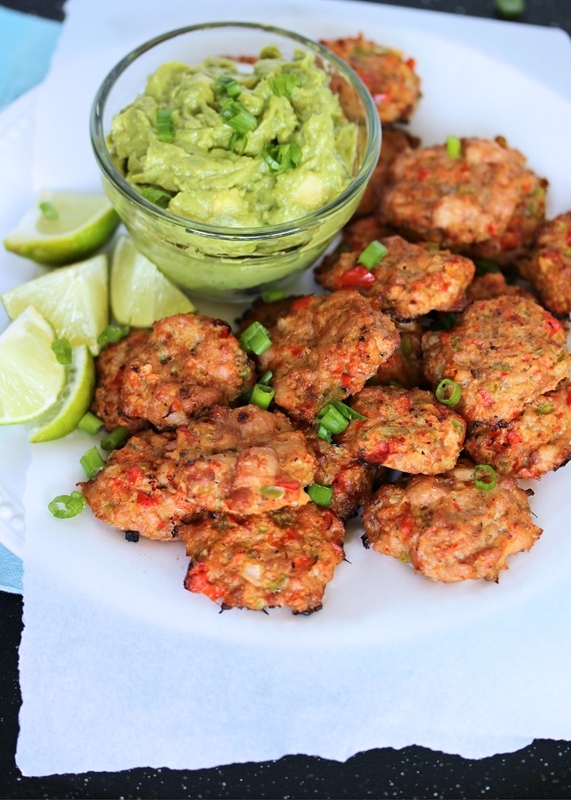 They are perfect dipped in some salsa, guacamole, or "Paleo ranch" - a meaty substitute for chips! Preheat the oven to 400ºF. Line a baking sheet with parchment paper or foil, and drizzle or spray with avocado oil. Pat the chicken dry with paper towels, then place in a blender or food processor. Pulse a few times to break up the meat. Add the remaining ingredients (peppers, onion, garlic, spices) and pulse for a minute or two, until everything is combined. Use a cookie dough scooper to scoop heaping tablespoons full of the mixture onto the lined and greased baking sheet. * You can leave them as is, or use your hands to flatten them a bit. Brush the tops of the poppers with avocado oil, or use a sprayer to lightly coat them. Transfer to the oven, and bake for 25 minutes. Broil for 3-5 minutes at the end to brown the tops. 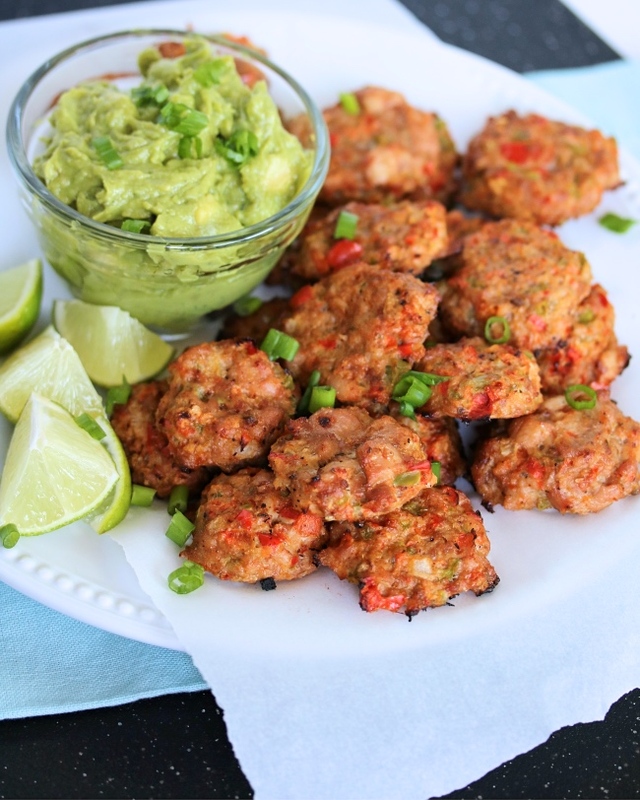 Serve hot, dipped in guacamole or salsa! If you don't have avocado oil, use whatever oil you have on hand. Cook the poppers in batches if you can't fit them all on one baking sheet. If you don't have a cookie dough scooper, use a tablespoon measuring cup to scoop instead. how long do you cook the chicken thighs for? The chicken thighs are raw, and bake in the oven- similar to a baked meatball! Hi, All I have on hand is ground chicken. Do you think it work fine? These look good! I may try them with canned chicken too. Any idea if these freeze well for a make-ahead meal? And how to re-heat? 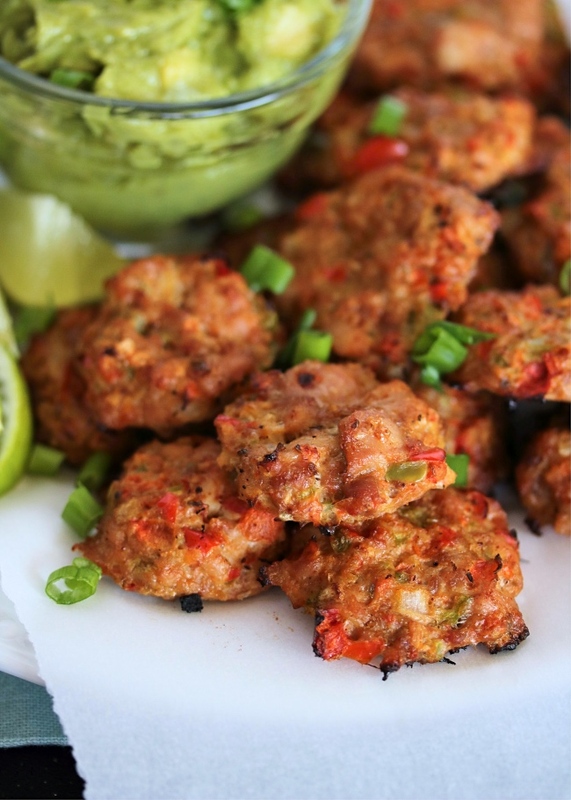 Think you could do these with shrimp or fish? They look amazing!